Enough’s June 2018 report, “Tools of Trade: U.S. Sanctions Regimes and Human Rights Accountability Strategies,” co-authored with the International Corporate Accountability Roundtable, underscores how economic sanctions provide financial and diplomatic pressure to further aid U.S. foreign policy goals and national security interests. Sanctions aimed at targeting individual actors, economic sectors, or an entire foreign government have in recent years become an attractive alternative to military action. Sanctions, therefore, are an increasingly important tool for policymakers and human rights advocates to understand, particularly as newer approaches are utilized, which include innovative targeting strategies and new robust efforts surrounding enforcement. 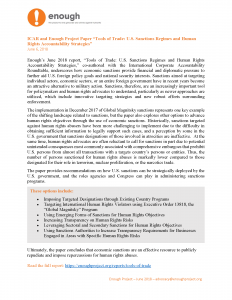 The implementation in December 2017 of Global Magnitsky sanctions represents one key example of the shifting landscape related to sanctions, but the paper also explores other options to advance human rights objectives through the use of economic sanctions. Historically, sanctions targeted against human rights abusers have been more challenging to implement due to the difficulty in obtaining sufficient information to legally support such cases, and a perception by some in the U.S. government that sanctions designations of those involved in atrocities are ineffective. At the same time, human rights advocates are often reluctant to call for sanctions in part due to potential unintended consequences most commonly associated with comprehensive embargoes that prohibit U.S. persons from almost all transactions with a targets country’s persons or entities. Thus, the number of persons sanctioned for human rights abuses is markedly lower compared to those designated for their role in terrorism, nuclear proliferation, or the narcotics trade. The paper provides recommendations on how U.S. sanctions can be strategically deployed by the U.S. government, and the roles agencies and Congress can play in administering sanctions programs.